In Europe, we are now seeing something unprecedented and amazing – a little good news for the environment. For every car sold, there are now 2 bikes finding a new customer, as per both the European Cyclist’s Association (Europe is the only place that has a body like that) and the European Automobile Manufacturer’s Association – it’s a fact. 2 cycles per car, and the popularity of the healthy, green transport is all but sky-rocketing. With the introduction of electric bikes last years – no, they are not scooters – which use an electric motor to increase speed, power, and distance travelled every time we pedal – making cycling easier without taking the cycle out of cycling, sales have gone up even further. 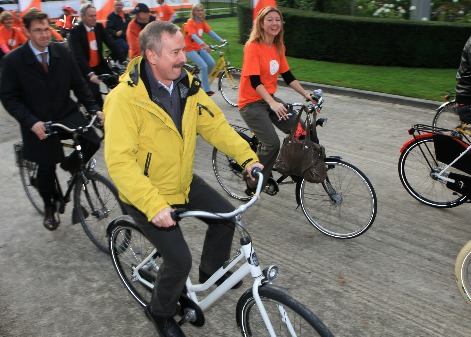 In countries like the Netherlands, cycles now outnumber residents, and cycle sales continue to grow. In Germany, once the world’s car capital – still one of the largest producers of automobiles – there has been a minimal rise in car sales compared to a 50% increase in bike sales in the last 10 years. Europe, which led us to the automobile revolution over a century ago, might be leading us into a new, eco-friendly, cycling revolution. And the way governments are handling it is as amazing, British PM David Cameron has continuously endorsed cycling through his term, while last week Rome’s mayor made a bunch of roads leading to the Colosseum cycle-only. It is the one place in the world where there are separate lanes and streets for bikes only – where cycling is cooler than driving. And with 10 million bikes sold last year, I hope the rest of the world can do the same.